Gaelic Football star Yvonne Bonner and former GIANTS Netballer Taylah Davies have joined the GIANTS as rookie signings for the 2019 AFL Women’s season. Bonner, from Donegal in Northwest Ireland, is set to follow in the footsteps of Cora Staunton by becoming the second Irishwoman to sign for the GIANTS AFLW team. The 31-year-old, who has been nominated for her second All-Star award, is hoping to have the same impact as Staunton, who lit up the competition with her attacking flair and unique kicking style in 2018. “For this to actually come true, it’s like a dream, I suppose, to know that I’m the next Irish girl to come out after Cora,” she said. GIANTS AFLW Head Coach Alan McConnell identified Bonner at the recent CrossCoders trial in Melbourne, which saw Bonner and 17 other athletes from six countries take part in a camp to test their abilities in a bid to be drafted or rookie-listed. “It’s fun, it’s great for our footy club and exciting for our playing list to add more talent like this,” McConnell said. “In the Gaelic game she plays a similar role to that of a forward, a goal-kicking forward. 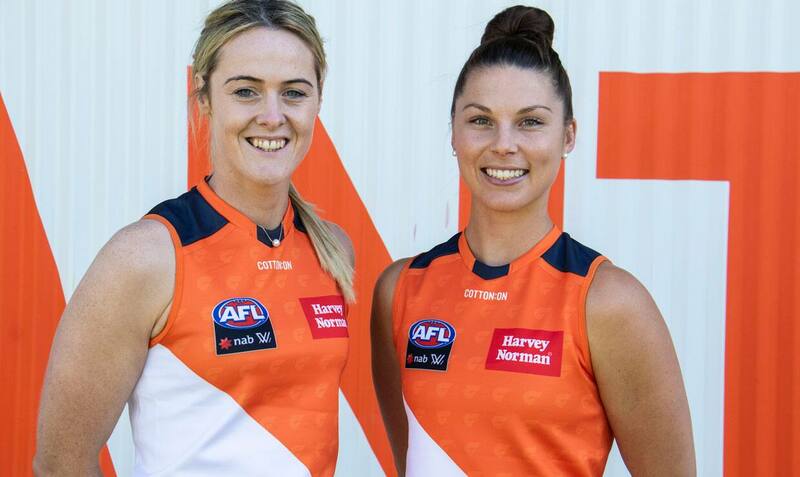 Meanwhile, Davies has swapped the orange dress of GIANTS Netball for the orange and charcoal guernsey of AFLW. The 23-year-old from Wollongong becomes the second GIANT to swap Netball for AFLW, with Elle Bennetts making a successful transition in 2018, playing every game and winning the club’s Rising Star award. Having played mostly wing attack and centre during her netball career, Davies has opted to try a new sport after representing both the Swifts and GIANTS in the national competition. “Alan asked if I wanted to give AFLW a go, which was something I never really thought about,” Davies said. “Learning to kick is very different to netball which was just your hands for catching and throwing. At 170cm, McConnell sees Davies being able to play as either an inside or outside midfielder. “Both girls are very athletic and quick, both play ball sports where they are used to using their hands. The GIANTS hold picks 12, 42 and 53 in the 2018 NAB AFL Women’s Draft, to be held in Melbourne on October 23.